Instead of the more complex friendship intricacies of the typical boy-meets-girl film, The Red Balloon (Le ballon rouge) goes for a simpler, more universal angle, one that crosses age and language boundaries by giant steps. It's boy-meets-balloon, and it's a 1956 French short film (34 minutes) from director Albert Lamorisse. On his way to school, a young Parisian boy named Pascal (played by Lamorisse's six-year-old son) "rescues" a large red balloon that is entangled on a lamppost. Like a faithful puppy, the balloon follows Pascal everywhere, playing games of hide-and-seek or causing problems at Pascal's school, and instantly the pair become inseparable. If we have learned anything from Frosty The Snowman, it's that certain friendships are destined to be short-lived, and while The Red Balloon is essentially a children's film director Lamorisse is honest enough to go beyond whimsy, and punctuate his film with the ugly, brutal ignorance of others. And that's where this one transcends being merely an entertaining kid's film, because the none-too-subtle adult message that comes out is to hold on tight to what you love because the world can be rather unforgiving. A little ugly, yes, but still full of radiance and beauty. This isn't some kind of harsh tale. Far from it, actually. It's top-loaded to be sweet and charming, full of storybook cobblestone Parisian streets and friendly shop owners, the sort of place where a young boy can bother a stranger just so he can put his balloon under an umbrella during a rain shower. The friendship between Pascal and the balloon is playful and familiar, and the screenplay has only a smattering of dialogue so that even without using the optional subtitles it is easy to know what's going on between the two. One of the most impressive things about The Red Balloon is the marvelous quality of the visual effects Lamorisse pulled off in order to appear to give the balloon a mind of its own as it moves through the twisty urban streets. Had this been shot today the balloon would be CG�naturally ultra-realistic�and no doubt full of exaggerated anthropomorphic features that would make the marketing of all sorts of toys easier to push. But Lamorisse shot this in the "old days" when effects were in-camera, and some of the techniques he employs are at times more stunning than the storytelling itself. 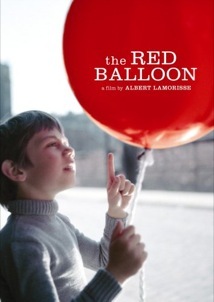 There is a moment when one of his tricks is partially revealed (thanks in part to the quality of the transfer), yet most of the time the magic behind the movement of the red balloon is not so apparent, and the beauty of the build up to the final shot remains a showcase of Lamorisse's talents. Image Transfer Review: The 1.33:1 fullframe transfer showcases Lamorisse's work�well past 50 years old at this point�with the sort of quality one expects from Criterion. The transfer is quite striking given its age, primarily when it comes to bursts of colors�the titular balloon particularly; this is complimented by consistently pleasing and warm fleshtones. Though edges are a bit soft, the clarity of certain shots is so clear that a couple of times the secrets of Lamorisse's balloon effects can be seen. And I'll bet those crackly 16mm prints of this that you may have seen in grade school never revealed that. Audio Transfer Review: Audio is presented in 1.0 Dolby Digital mono, featuring the original French language track. Very clean and hiss-free, the only quibble might be a somewhat tinny texture, an issue that sometimes renders passages more harsh sounding than others. Certainly more than passable, yet perhaps graded a bit tougher given this comes from Criterion. Extras Review: Criterion's typical abundance of supplements is notably absent for this release, with just a foldout insert featuring four paragraphs of kind words for Lamorisse's film from Criterion managing editor Michel Koresky. The foldout also sports a few stills from the film, including the beautiful final shot, so if by some chance you have never seen The Red Balloon, hold off looking at the insert until after you've watched the film. The theatrical trailer is also provided, as are ten chapter stops (including one for color bars), as well as optional (but never necessary) English subtitles. Albert Lamorisse's 1956 classic short gets an impressive video transfer from Criterion, and priced at under $10, there is absolutely no reason this should not be a part of any self-respecting DVD library. It may be labeled a children's film, but don't let that sway you. If you have never had the pleasure of seeing The Red Balloon, now's your chance.